The “Mars” curse is a known phenomenon in Hollywood; that is, if a film about the Red Planet is released in cinemas, it’s almost always going to bomb at the box office. The numerous examples include Mission to Mars, Red Planet and – perhaps most notably – Disney’s John Carter, which today is still considered one of the biggest financial disasters ever. The moral seems to be, and it’s no coincidence that it sounds so science-fiction-y, stay far away from Mars as is humanly possible. Luckily, an unlikely hero that could break the curse once and for all has emerged: Ridley Scott. 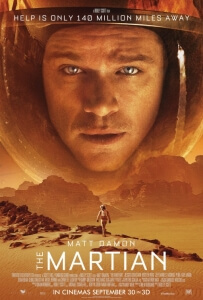 The director, who in recent years hasn’t had a particularly strong track record (Prometheus, The Counsellor and Exodus: Gods and Kings all underperformed with audiences and critics), bounces back in spectacular style with the witty, smart and extremely enjoyable adaptation of Andy Weir’s best-selling novel The Martian. In it, astronaut Mark Watney (Matt Damon) is stranded on Mars when he is presumed dead after a freak sandstorm leads to the abortion of the manned mission. However, unless Watney finds a way to survive with the planet’s limited resources, he really will be dead. Basically, it’s Cast Away with a lot of red sand. Working from a lively and tireless script by Drew Goddard, Scott lets go of the pretences that bogged his more recent films down and allows the playfulness of Goddard’s screenplay to speak for itself. At all times it’s a story about survival, but the sense of humour that is wilfully inserted into the proceedings gives it a more human touch – through various video logs, Watney bluntly states that in order to survive he has to “science the sh*t out of this”, and as his first photograph to be sent back to Earth he spontaneously re-enacts the signature pose of The Fonz from Happy Days. It helps that Watney is an easy character to get behind, and part of it is due to the writing but a great deal more from Damon; the actor adds a great deal of snark and charisma to a character that’s already filled with both, and his physical commitment (just wait until you see his body after seven months of eating barely anything) is just as effective as his emotional engagement. Oh, and yes he DID also play a similar role in last year’s Interstellar; now that that’s out of the way, can we move on? As much as we’d like it to be, The Martian isn’t a one-man show. Every so often, sometimes for long stretches, the action cuts back to Earth where NASA is figuring out how to rescue their missing astronaut when they learn he is indeed still alive, and also to the returning crew of the abandoned Mars mission who debate whether or not to defy their superiors and go back for their friend. These sections give the supporting cast a good amount of room to flex their abilities; they include Jessica Chastain as the crew’s guilt-ridden leader, Chiwetel Ejiofor’s Mars expert, Jeff Daniels’ head administrator for NASA, Kristen Wiig’s PR doctor, and many others. There’s absolutely nothing wrong with these sections of the film, they’re written and directed and acted well, but a lot of it does take away from the atmospheric feel of the isolated conditions its main protagonist is in, and some of the other actors in the crowded ensemble are given the shorter straws such as Kate Mara (the second major film this year where she’s been mostly wasted) and Michael Peña. At nearly two and a half hours, it’s far longer than it probably needs to be; but at the very least, it’s never dull. You do want to see this guy get out of his situation, you do want the people back on Earth or in space to succeed in rescuing him, and it’s thanks to the liveliness that shows in both Goddard’s script and Scott’s direction – for instance, a launch sequence is set to David Bowie’s “Starman” – that you are rooting for smart and likable characters to carry things out without incident. It’s certainly Scott’s best film in years, one of Damon’s biggest acting showcases in a good long while, and maybe, just maybe, the film to finally break the Mars curse with critics and box office intakes. We certainly hope the curse doesn’t creep up onto The Martian, because for once it actually makes the Red Planet look pretty damn awesome. The Martian combines director Ridley Scott’s strongest work in years, a witty script by Drew Goddard, and a great central performance by Matt Damon to make a hugely enjoyable survival film, which is enough to forgive its more obvious flaws.